You can after use it from the script by cliking on the big button "Make it"
This is what I was waiting for (particularly encoding files). I have directories with spaces in the name. So at least one pair of #$q is missing in the script. Thanks for posting the Script with version number and Screenshots. This should be a great Plugin. Thanks! When testing and build my first Script. I get this error. I think that this is also a 'Directory names with spaces' issue like i replied before. This is a WinBuilder bug. It is fixed in the latest 052 beta3 version. When you click on the Browse button for the "Source" files and you try to select the folder contents of the program you cannot see any files. The exe dont show up even though there are there. So i have to do a manual copy and paste of where the files are located. The Add contents to System32 Browse button works. It seemed to create the New Script. When I click on the New created Script it gives the following error. Not pointing to the Jpg seems to fix the error thing. I see the New Script created. The image file im tying to use is a JPG sized at 98x92. I tried to manually add the image after creating the New Script and it cuts off a bit of the contents of the image. I have to make it a bit smaller so it will fit. Maybe someone can point out how to fix that. It now adds the System32 files but it does not add the files for the application. For select the app in the dialogbox you have "all supported files" change it to "all files"
I don't know why the dialogbox is set to select image and how to change it , if some have idea ? Can you change the version number when you make changes thats how I know you have updated to a new one. Doing this I could see the exe file. The all files thing might have to be added to Winbuilder as an option by Nuno, unless it can already be done. Testing the latest. It now creates a new Script. 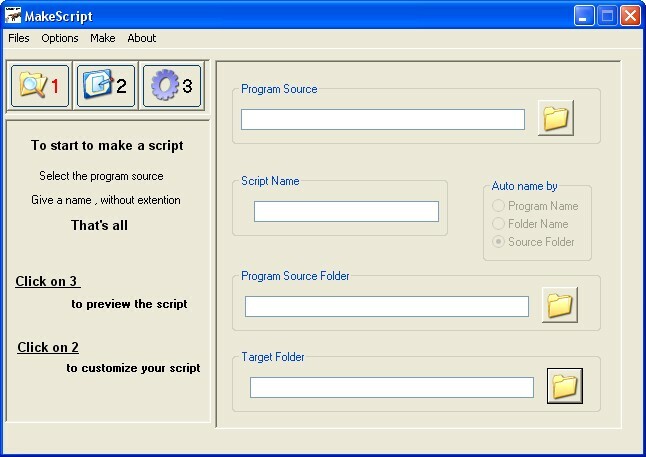 The system32 files are encoded into the Script. It also puts the image in the Script. It still does not encode the files even when you select the "all files" option. The all files thing might have to be added to Winbuilder as an option by Nuno, unless it can already be done. Just arrived on this post because I've spent the last few days with very short online networks.. I've read the above posts, but what can I do to help? Can you please explain in more details? Here is the result we are getting when you click on the browse button. Picture explains in more detail. Why not try Delphi to do the job? I already tried to understand your au3, but no success. ShellExecute,Hide,"cmd.exe", "/c for /R #$q%SourceProgram%#$q %1 in (.) do echo %~f1 >> #$q%TMPscript%#$q"